Oklahoma Beagle Rescue View other Beagles for adoption. PENDING ADOPTION Gypsy Rose is a 20 lb. 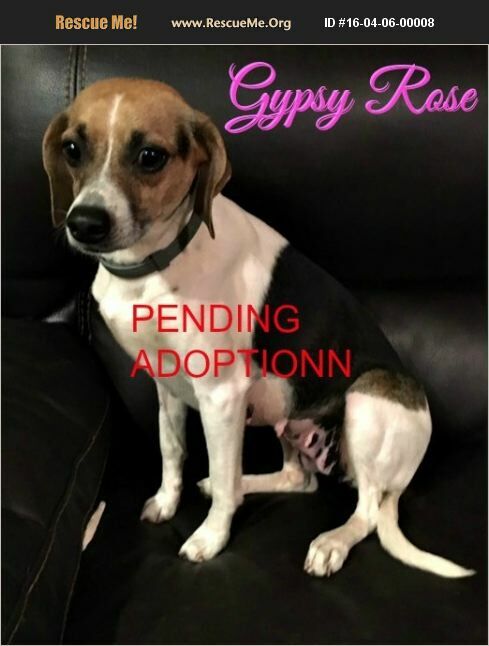 2 year old Beagle mix who used to be someone's faithful loving pet but for some reason when they decided to move they left her behind to fend for herself. For approximately a year she roamed the highways in search of discarded food. She would on occasion sneak a little good from surrounding homes. She took shelter in the woods most of the time or would go back to her old home and sleep under the porch. We tried for months to rescue her but she was to fearful of humans. It wasn't until we noticed that she was "very pregnant" that we decided it was time to trap her. One week after getting her into a safe home she gave birth to 11 puppies. The puppies are 8 weeks old now and are ready for their new homes and so is she. Gypsy is spayed, up-to-date on her shots, is heart worm negative and is Micro-chipped. She is crate trained and potty trained. Gypsy is a very faithful dog once she gets comfortable. She would make a wonderful companion for any family. She must have a 6' fence to keep her safe. Her adoption fee is $85. TO MEET ONE OF OUR DOGS AND POSSIBLY ADOPT, YOU MUST FILL OUT THIS FORM SO IT CAN BE SENT TO THE FOSTER. ::https://cimarronvalleyhumanesociety.wordpress.com/adoption-application/ or email cimarronhumane@yahoo.com. We do adopt out of state but we do not ship animals, If you want to adopt one of our animals, you must come to pick them up in Oklahoma. If you see an animal and it doesn't say pending adoption at the first of their bio, they are still available unless adopted that day! Our listing is updated multiple times a day. Most of our dogs are being fostered in Stillwater Ok.